As Texas divorce attorney John K. Grubb emphasizes on his website, listen carefully when you are on the stand. Make sure you understand the question. If you don't, ask the attorney or judge to clarify the question. Even if you do understand the question, repeat the question silently to yourself before you answer. If the opposing attorney is questioning you, this delay will allow your attorney time to object to the question if he so chooses. When you answer, especially on cross-examination, choose "the shortest answer consistent with the truth, and shut up," Grubb says. Don't add details or volunteer information. Don't raise your voice, become argumentative or rip into the character of the other party, cautions South Carolina family attorney Gregory Forman on his website. Even if the answer might hurt your case -- for example, if you are asked whether you had an affair during your marriage -- always tell the truth. As a legal matter, you are under oath and the penalties for perjury can be severe. As a practical matter, the truth likely will come out anyway, and false testimony can torpedo your case with the judge. Understand that everyone in the courtroom is watching and evaluating your testimony when you are on the stand, so act in a reasonable and calm manner, even if the questions are harsh or accusatory. If you are at one of the tables for the parties with your attorney, don't talk or react strongly to anything you see or hear from another witness. Communicate with your attorney by writing a note to him. The website of the Reese & Escobar family law firm in Texas advises you to dress appropriately -- tuck in your shirt and don't show up in warm-up clothes, shorts, T-shirts, flashy jewelry or piercings. Address the judge as "Your honor." Although the opposing lawyer won't ask you, "When did you stop beating your spouse," there are other games some attorneys play to trip you up. Since people have a natural inclination to agree with someone who asks them questions, watch out for compound questions with two parts, questions that makes assumptions that aren't true, and questions that erroneously summarize so-called facts, Grubb cautions. Don't fall into the trap of guessing -- it's perfectly fine to honestly say you don't remember an event or conversation. Your attorney likely will prepare you to testify by peppering you with questions the opposing attorney might ask. This is the time to work on remaining calm, consider your answers carefully and resist any temptation to embellish the truth or become defensive. 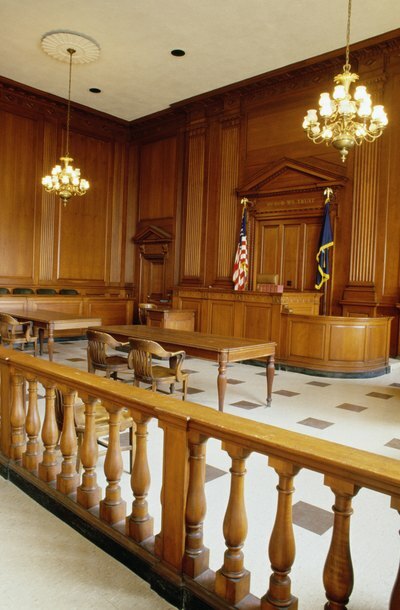 In addition, observing another divorce case might make you more comfortable with the courtroom environment and protocol when it's time for you to testify.